Here's something I came up with on the go. In the spirit of complete disclosure, I must admit that I got this sauteed mushroom beauty from my brother who had whipped these up to serve along with some barbecued beef strips at out last barbecue. It was delicious and everybody loved it (even the mushroom haters.) This is so simple and easy to put together and even if you aren't planning on barbecuing anything, this would work really well as a side dish. A few days ago, I was feeling completely uninspired about what to cook up for dinner. Yes, that does happen to me sometimes. And as a last minute light bulb that sprang to life in my head, I realized that I had some yummy button mushrooms in the fridge. Immediately I thought of the sauteed mushrooms, but it struck me that I didn't want to do anything fancy besides this. I simply toasted some bread and served the mushrooms with the bread and a nice fresh salad alongside. That was a simple, yummy weeknight meal for us. Place the oil and butter in a pan over medium heat. Add the mushrooms and saute till they're done. Don't overcrowd the pan as the mushrooms will just stew in their juices. Do this in stages if you're using a small pan. Drain the mushrooms and keep aside. Using the same pan, add a dash more oil / butter, if needed and tip in the garlic and onions and saute them on medium heat till they're lightly caramelised. Add the chilies and the mushrooms. Season with salt and pepper to taste. Stir to mix well. You can add some chopped coriander leaves at the end. I didn't have any that evening, so I just left that out. Lightly toast slices of bread and cut in halves and place the stir fried mushrooms over it. OOoh, this sounds great! It's been way too long since I've had mushrooms! What a wonderful inspiration Trisha! 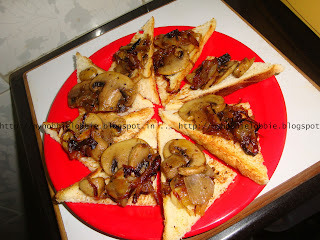 Those mushroom toasts look absolutely delicious! I love mushrooms - lovely recipe, i always grate mushrooms to make my kids eat...........u have a nice space Trisha...keep going !